I don't see my brother often (my fault) and when I do, he makes sure to quiz me on things like prime numbers and the such. This is his way of clearing everyone from the table who can't run with the big dogs and also from keeping the conversation from going on to gossip and other such nonsense. I think its also his way to deal with my superhero ability to spill things, but that's another conversation, elsewhere. By the end of the first page I knew I needed to send this book to my brother. Already I planned to give him The Perks of Being a Wallflower and The Book Thief. Those are must reads, beyond the super greats into the "required" category. Two pages into the book I was taking pictures of the wisdom-dense spages and posting them on facebook. I didn't know people were REQUIRED to turn in any prime numbers (? over 100,000?) 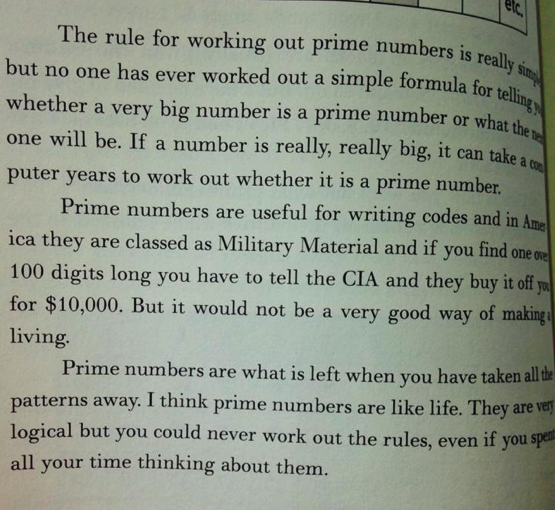 to the CIA/NSA for $$$ because prime numbers are an uncrackable code. What a way to pay off student loans. This book is THAT wise, that sharp, that creative, that amazing. The narrator's sensitive yet crazy-bold voice hooks you in his first intense, confiding, raw syllables. He reminds me of RainMan. More fluid, more lyrical, just as intense and mathematical. The narrator was a teenager out for a walk. He needed to go out in the middle of the night to take walks, he was like that. He saw his neighbor's dog, stabbed bleeding and dying. He wanted to figure out why the dog died. Because of how he was wired he needed to figure this out mathematically, logically. He was a guy who couldn't tolerate hugs or handshakes and didn't understand facial expressions to the point that a friend made him a short-lived chart of a variety of faces with eyebrows showing shock, anger, surprise. He tried to use it as a cheat sheet for several conversations but it turned cumbersome so he withdrew to his safety. I refuse to ruin this book for you. It's creative, smart, grand, small, intense and beautiful. You WILL read it. But besides that if you FORCED a summary out of me to prove to people who read this book that I also read it, I would say this. I think that this book shows how the crucial event of the murder of a dog leads to him to a logical mathematical understanding of just exactly how and when his family was destroyed and saved.